There was a rather hysterical fan forum debate – someone had created a in game management tool for family planning and it meant that same gender couples could be triggered to produce offspring. People were upset and complaining that that was not realistic. IT was pointed out to them that zombies, vampires and ghosts existed in the game – and magic. I asked why they cared about how other people played their own games. if people didn’t want the tool, they didn’t have to download it and if they did, they didn’t have to use it that way. The Sims 2 added several new elements – first – Digital DNA – offspring now merged the appearance of the parents. Which also meant – characters aged – and a new life period was added – University. The game also allowed for more home activities – and seasons – as well as apartment living. In addition to the Expansion packs which added another life dimensions, Sims 2 also included themed “stuff” packages – expanding the inventory of items. Creating business partnerships as well with real life companies like Ikea and H&M design firms. I stopped playing the game with The Sims 2 because at the Bon Voyage Expansion they added SecuRom digital rights management software. installing that resulted in my writer drive being disabled as was my legal disc authoring software. they are programed to act like people and how to read, understand and interact with predictable results is as easy as reading the navigation panels. 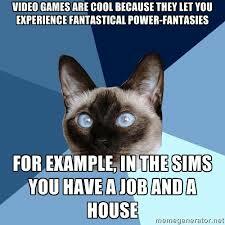 The Sims 3 continued to add complexity of dimension and let the sims truly out of the simhood. This entry was posted in Zeitgeist Analytics and tagged Artifical Life, Electronic Dolls, Paper Dolls, Simutating People, The Sims. Bookmark the permalink.